This magical mid-century 'pulled ear' opalescent Fratelli Toso wonder is readily identifiable as such; Leslie Pina documented this beautiful vase in "Fratelli Toso" and this piece has TWO of the telltale Fratelli Toso labels--the Castle Imports label and the blue/silver "Made in Murano" label on the base.. The complexity of this piece and how it plays and changes in the light in a range of cranberry, pink, to purple is extraordinary, as is its pristine condition. * We're always open to offers--if you see something you like, drop us a note! We will never send you unsolicited messages! 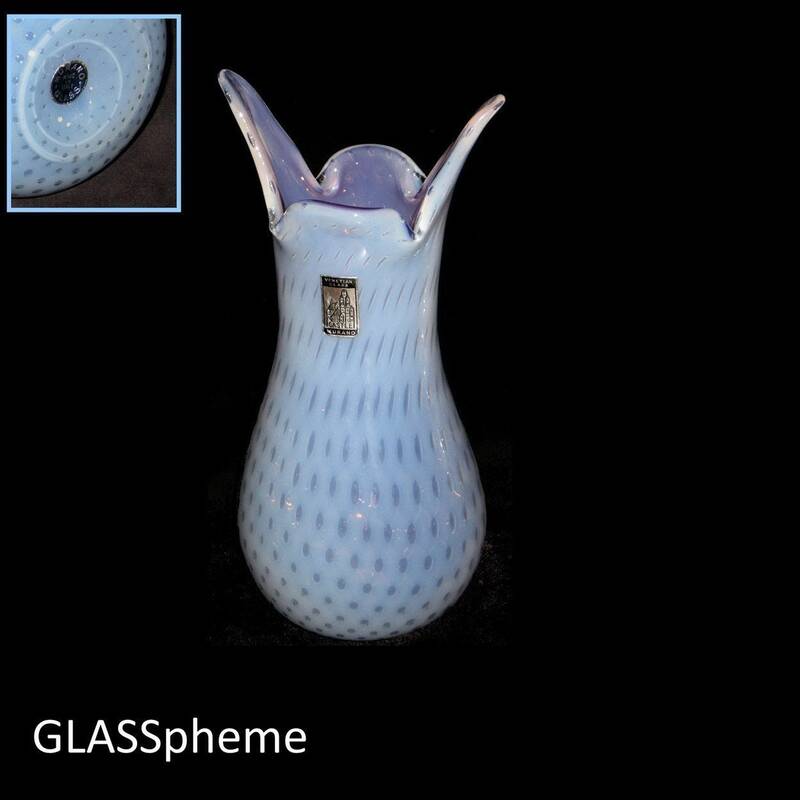 Customers and friends who wish to recieve first word of our promotions/coupons can subscribe to our mailing list by emailing Glass@GLASSpheme.com with SUBSCRIBE in the subject line. GLASSpheme loves custom orders! But how do we 'customize' vintage glass? Simple. We love glass and we love our customers--and there are many ways we can help! 1) Volume discounts: Let's say there are several pieces you MUST have. Let me know, and I'll send you our very best price for the lot. 2) Custom displays: Say you have a special place in your home that SCREAMS for a glass display. Send me a photo of the space, your budget, and the accent colors for your room, and we'll send you photographs of possible groupings and our special pricing for the lot. 3) Tell us what groupings you have in mind, and we'll photograph them together for you so you can see how they'll look together. Can I Select Custom Arrival Dates? GLASSpheme ships your purchase on the very next business day, but we're flexible too! If you're going away on vacation or have a special date you'd like your gift to arrive, send us a note, and we'll time our shipping for you! How can I get coupons for your shop and be informed of sales? Simple! Join the GLASSpheme mailing list! Paste this link in your browser, send us your email address, and VOILA--you'll be among the first to know when your favorite piece of glass is on sale, or when we're offering coupons. We sure do, all the time! Simply send us a photograph of the pieces you wish to sell and we'll make you our best offer! If you accept it, all you have to do is send us an invoice through Paypal, and ship it to us, if local pick-up isn't possible.